It is 100% acacia senegal, the highest grade available, and a natural, pure, organic, soluble dietary fiber produced from the gum of the Acacia tree. Clinical studies have shown that soluble fiber, as part of the diet: helps soothe and regulate bowel mobility; relieves IBS abdominal pain and cramping by stabilizing intestinal contractions; alleviates BOTH diarrhea and constipation. 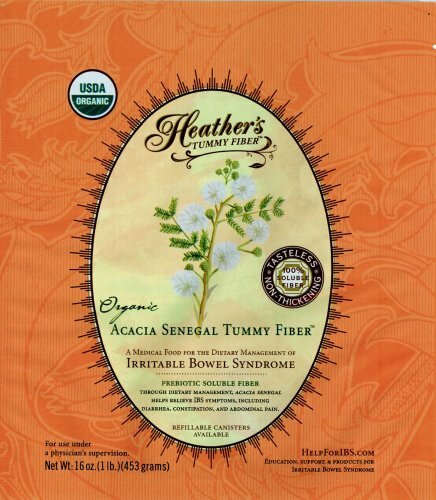 Heather’s Tummy Fiber also: increases good gut flora – it’s considered a prebiotic; has excellent gastrointestinal tolerance; and slows down colonic fermentation, which in turn decreases gas and bloating. Heather’s Tummy Fiber is completely safe and healthy for daily, lifelong use, is safe for use in children, and has no GI irritants or stimulants. 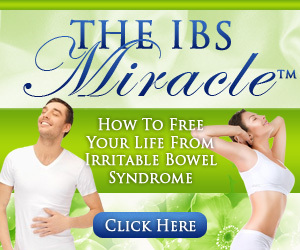 Soluble fiber will not compromise normal bowel function at all once it gets your IBS symptoms under control – it will simply keep things in that normal state. A soluble fiber supplement is meant to keep your GI tract running smoothly, comfortably, and pain-free on a day-to-day basis, now and forever. Heather’s Tummy Fiber is NOT a drug, it is NOT a laxative, it is NOT an anti-diarrheal medication. Acacia is simply an organic, prebiotic soluble fiber supplement with absolutely nothing else added, and it normalizes bowel function naturally in the same manner as soluble fiber foods. Certified organic by QAI, vegan, and certified kosher. Contains no gluten, sugar, salt, corn, soy, or yeast.